The Triple Alliance by Zoe Saadia is the bitter sweet finale of The Rise of the Aztecs’ series. Bitter because it almost broke my heart to say goodbye to my beloved fictional friends and sweet because Saadia gives her readers the perfect ending. The story begins in 1439, eight years on from where The Sword finished. Saadia uses this time shift to pick up the story of Kuini’s children. This is particularly poignant for fans of the series as we have been following Kuini’s journey from when he was a pre-teen himself. His children, Ocelotl, Coatl and Citlalli are eighteen years old and entering into adulthood. Their lives have taken divergent paths over the past eight years but they find themselves reunited in Tenochtitlan during a festival to celebrate the winter solstice. There are tensions between the three as they struggle to overcome the resentment that has developed as a result of Ocelotl living in the Highlands but they soon fall into their old roles as they become embroiled in a plot to kill the chief advisor Tlacaelel. Saadia is, without a doubt, a historian who painstakingly researches the subject matter of her books. However, even if you are not a lover of historic fiction, the strength of Saadia’s writing for me is the way she encourages us to evaluate the human condition, her depiction of history highlights that nothing really changes. Our way of life may have developed but the human race is still making the mistakes that we’ve always made – most probably since time began. The driving force for most of the characters within The Triple Alliance is the quest for power. Tlacaelel is the power behind the throne of the Emperor. He’s a visionary who is largely responsible for the rise of Mexica and the powerful alliance with Texcoco and Tlacopan that ensures their reign of supremacy. However, Tlacaelel has no understanding of people and his desire to unify everyone under one God and ruler is unrealistic. The populace of Tenochtitlan, despite Tlacaelel’s sophisticated projects to build waterways, bridges and other new impressive buildings, is a seething mass of anger and division. The different groups of people have been forcibly merged together and each group views the others as “foreigners”. We only have to look at the current mass migration taking place in Europe and the explosive levels of racism and xenophobia following in its wake to see that Saadia’s account of the past is still very relevant. Even the women, who essentially belong to the noble men of the Empire, are jockeying for positions of power through their men. There is very little sisterhood in the palatial households where wives are often cast aside for younger and more appealing women. The exception to this is Tlalli, who as a commoner and concubine has very little social standing but has gained the respect of all who know her through her accomplishments and generous spirit. The Triple Alliance reinforces the idea that women at that time had no power at all. Citalli, like her mother before her, is viewed as a valuable commodity and has been trained to be a wife from a young age. By the age of eighteen she has already been married off to the heir of Tlacopan. A marriage she had no say in whatsoever. Citalli is a strong character who is volatile and not afraid to speak her mind but her sense of power is misplaced as ultimately she is at the mercy of the men around her. The relationship between the three siblings is presented by Saadia in a very real and interesting way. Both Ocelotl and Coatl feel the pressure of having to follow in their successful warlord father’s footsteps. Ocelotl in particular struggles to find his own identity as he has a disability and can’t complete with Coatl and his father physically. However, under his grandfather’s guidance, he learns to value his own strengths rather than comparing himself to others. Citalli has strong feelings of kinship with both brothers but her attachment to Ocelotl becomes so intense it creates an inappropriate sexual tension between the two of them. Saadia explores this dilemma in a sensitive and thoughtful way which elicits feelings of compassion for Citalli who has no idea about her true heritage. In giving the final novel over to the young characters, Saadia allows her series to come full circle. The youth of the characters inject the story with energy and fun regardless of the tense and serious backdrop. As with all her novels, Saadia assuredly offers her readers edge of your seat tension, leaving us desperate to learn the fates of our beloved characters. The Triple Alliance is an exciting and satisfying read which works perfectly well as a standalone novel. 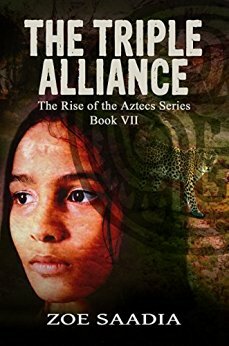 However, I cannot recommend The Rise of the Aztecs’ series highly enough and guarantee that if you give it a try you will be hooked and fully invested in the rich lives of Saadia’s wonderful characters. Part of me is devastated to have come to the end of the road but the great news is that Zoe Saadia is such a prolific writer there’s a whole new series waiting for me. I’ve skimmed through this so I won’t remember too much ;-) but I can see it’s another of your brilliant reviews. I’m just reading book 3, got a lot of catching up to do!